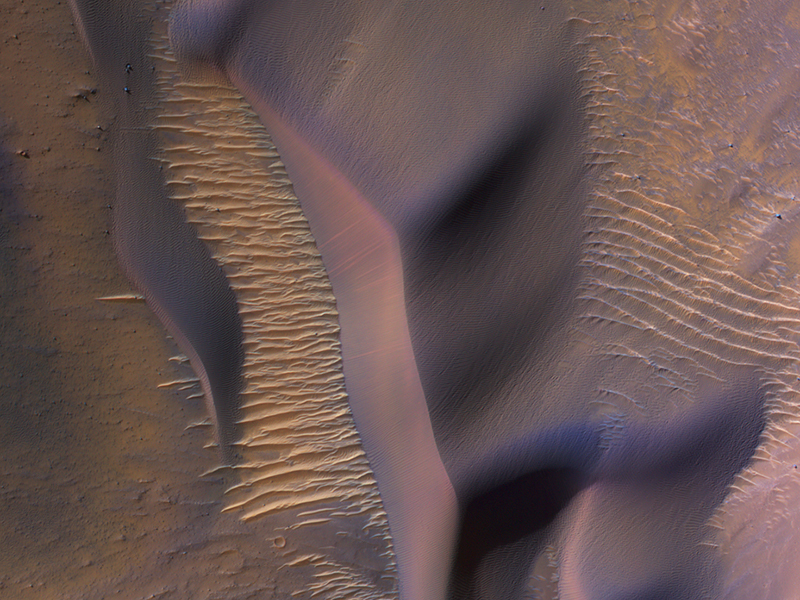 Sand dunes in Valles Marineris can be impressive in size, with steep slopes that seem to climb and descend. 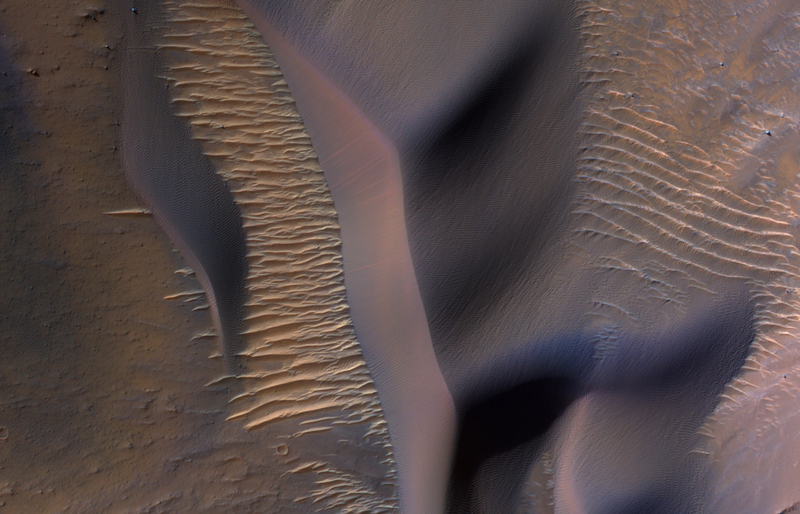 An enhanced-color cutout shows some of these on the slopes of Nectaris Montes within Coprates Chasma. The brighter bedforms are inactive while the bigger dunes move over the landscape, burying and exhuming the surface. This is a stereo pair with ESP_054029_1650. 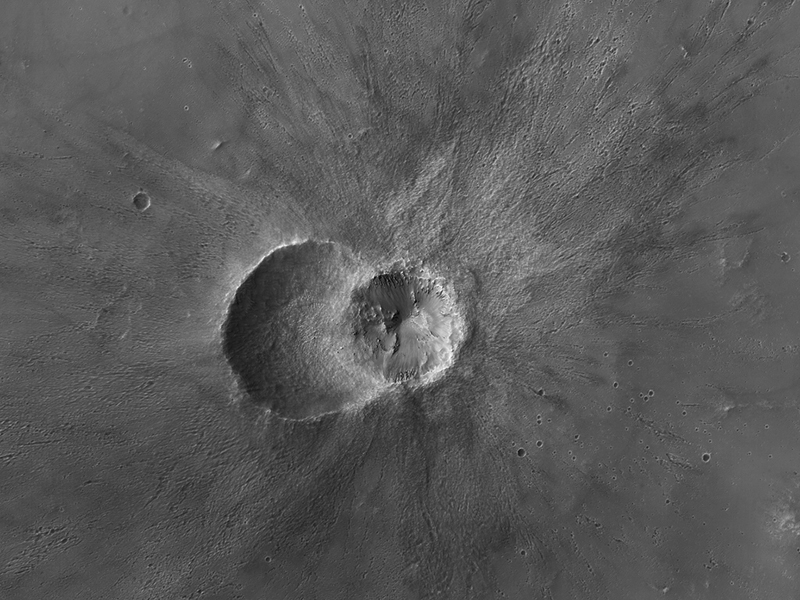 This image shows two small impact craters located in Meridiani Planum. This is an example of the geologic principle of superposition: figuring out what happened first by looking at how features interact with each other. We can see that one of the craters must have hit the surface after the other was already there, but which came first? 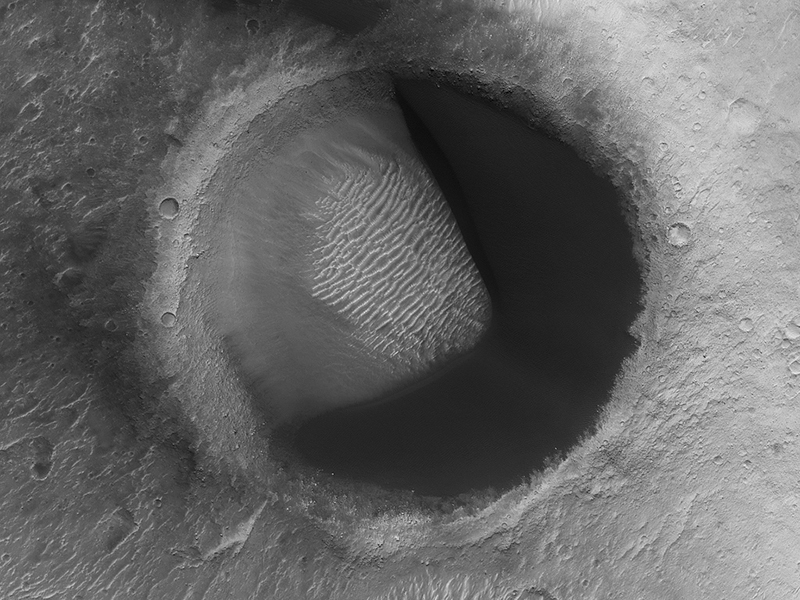 We can see that the ejecta blankets look rougher on the right side of the image than they do on the left. This could mean that the right side ejecta is newer, and hasn’t been exposed to the wind as much as the left side has. Zooming in, we see small boulders on the floor and walls of the left-side crater, and they even seem to match the rough material in the ejecta on the right. With these clues, we can hypothesize that the crater on the left was here first. After some time another asteroid hit, formed the crater on the right, which threw material onto the floor of the left, where it remains to this day. This is a stereo pair with ESP_050704_1700. 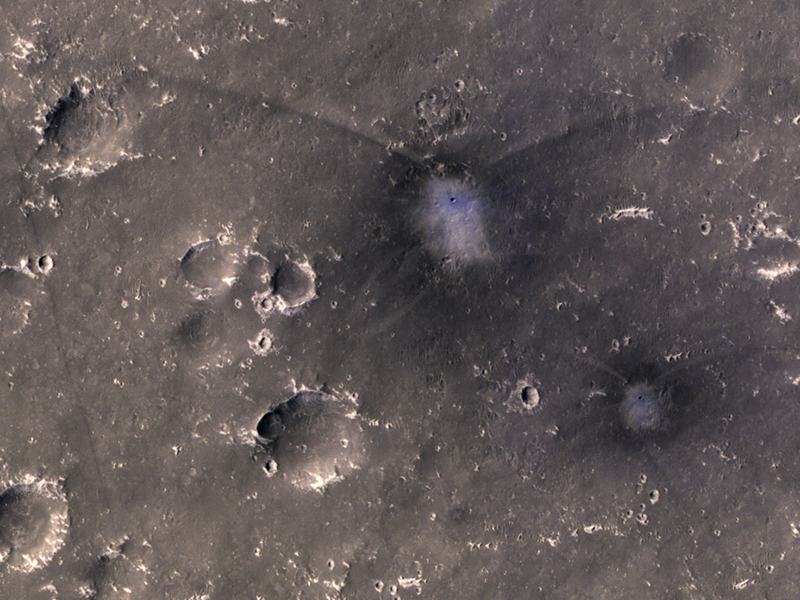 MRO has discovered over 700 new impact sites on Mars. Often, a bolide breaks apart in the atmosphere and makes a tight cluster of new craters. 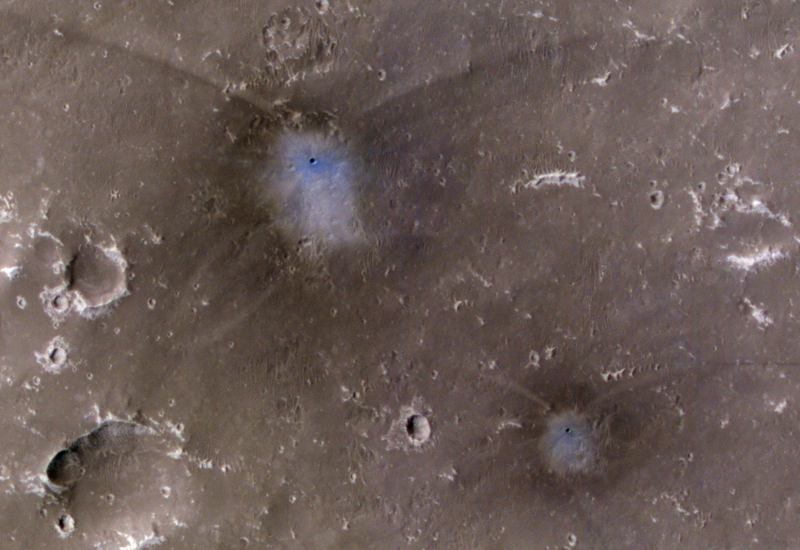 Here we see just two new craters, both with the same distinctive pattern of relatively blue (less red) ejecta surrounded by a dark blast zone (where dust has been removed or disturbed), and with arcing patterns extending northwest and northeast. This pattern indicates an oblique impact angle with the bolide coming from the north. 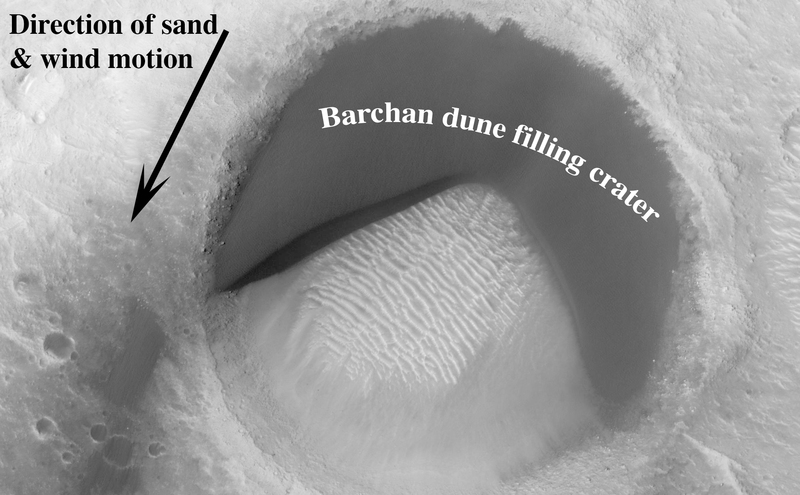 Barchan sand dunes are common on Mars and often form vast dune fields within very large (tens to hundreds of kilometers) impact basins. The regions upwind of barchans are usually devoid of sandy bedforms, so if you were walking in a downwind direction, then the barchans would seem to appear out of nowhere. As you walk downwind, you would notice the barchans link up (“joining arms”) and eventually slope into featureless sand sheets. We call this progression of dunes a “Herschel-type dune field” named after the first place this sequence was described: Herschel Crater. But here is something interesting: a barchan dune filling the upwind portion of a small impact crater in a Pac-Man-like shape. This “dune-in-a-crater” is nearly at the highest extent of the field. It’s also probably a rare configuration, and over the next few tens of thousands of years the sand will be blown out of the crater. Enjoy it while it lasts! That top dune pic is a knock-out; wow! !